Feeling Blue? Not With These Colors!! 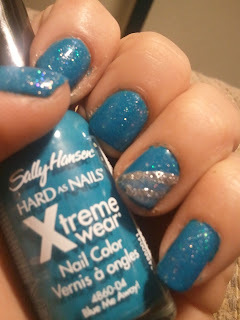 I am not normally a fan of blue polishes, but Sally Hansen's Blue Me Away really did exactly as the title states! 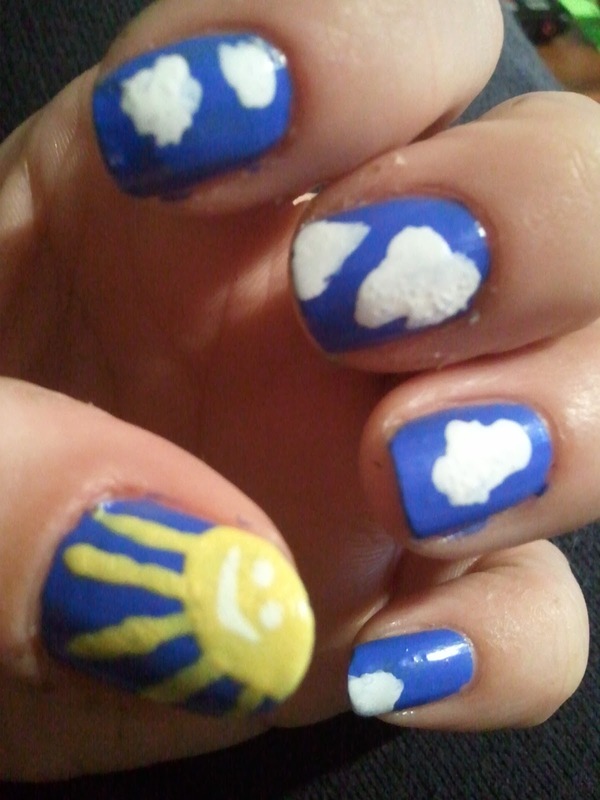 It is such a vivid, bright sky creme blue and it was on sale. Done deal! I am still in a sparkly mood so I added a coat of Spoiled My Saturn Broke Down. Although it looks like it has a blue base, I don't think it darkened BMA much at all. On my accent finger, I added HITS Poseidon. I love the HITS line and Poseidon sparkles well in the bottle, but I just don't love it, so I added a couple quick lines with a cheapie silver nail art brush. Excuse the nubbins. :( I've been holding off on posting recent pics since my nails are so short at the moment, but this was too pretty not to share. 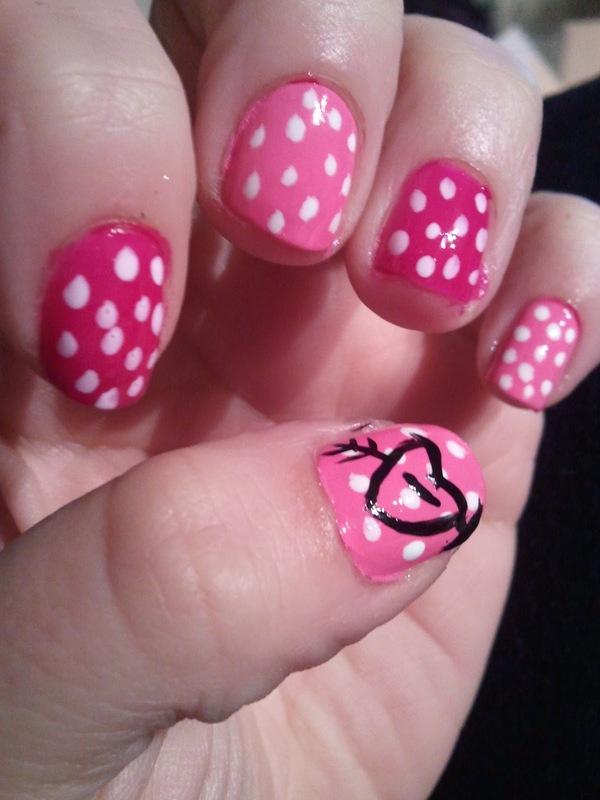 This was done for Valentine's Day, but since my nails are shameful nubbins at the moment, I am using some older pics! 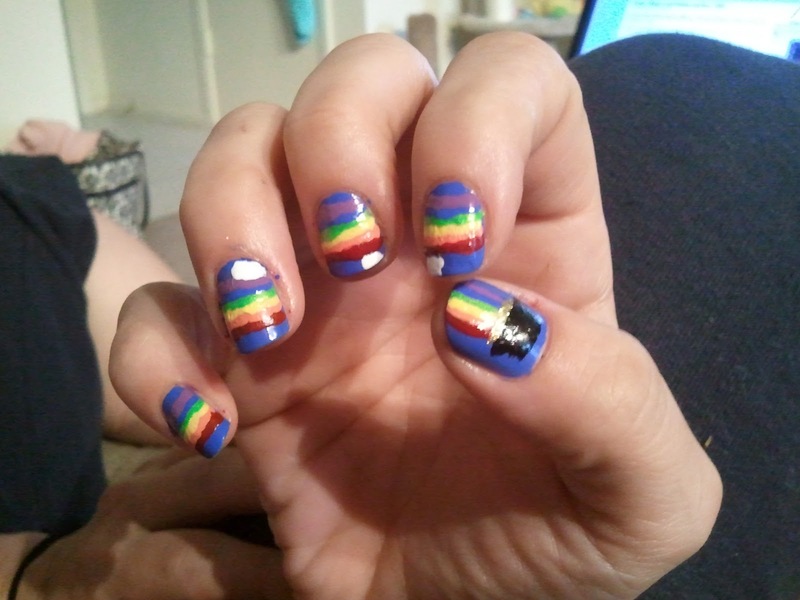 I am glad I started talking pictures of my nails. It has kept me accountable as a non-biter (until recently. Ugh. Everyone relapses once, right? ), I've met some fabulous ladies and joined a few great nail groups, and it encourages me to be more creative! Since I have had allergies for my entire life, complete with itchy, red eyes, I have always thought of mascara as something to buy cheaply so I can replace it often. 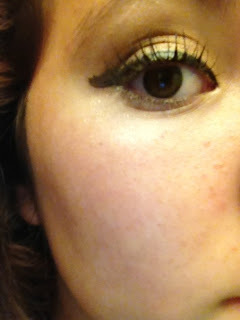 I have always had decent results with drug store brands, and Maybelline Define-A-Lash has been my go-to for years! I still love that product but when I was recently given a Sephora GC, I jumped at the chance to try Benefit's They're Real mascara. A couple of my lovely friends had tried it with excellent results and rave reviews, so I purchased a tube. It isn't terribly expensive, at $22, compared to other products Sephora carries and especially compared to very high end products, but it's certainly more than my Maybelline. I waited until Sephora's Friends and Family sale earlier this Spring, went through eBates (which is awesome, if you don't have it and you shop online, you NEED to check it out!! ), and used a gift card, so this was an easily justifiable splurge. I'm just going to sum up my opinion of They're Real in one word: Wow. I have sleepy eyes in this picture but I do my makeup in the am and barely touch it up all day, except for lip balm. This is when my makeup is freshest and looks best for photos. I am truly impressed. The key to this mascara is the brush. Take a look at the ball shaped brush on the end. You can use this, holding the wand vertically, to push up every single lash. It is easy to get the corner lashes and it certainly makes my sleepy eyes look much less sleepy. That is a serious bonus when you decide to teach a 7:30am class, haha. 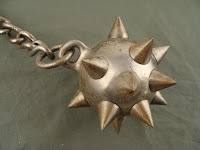 The ball at the end reminds me of a medieval weapon, which is called a flail. Thank you, Google for that one! I highly suggest you try this mascara if you're in the market for a new one. The tip pushes up every lash for a great wide-eyed look. There is no flaking either and the curl lasts all day. I do use 3-4 coats of mascara but I don't use an eyelash curler! I've actually never tried a curler, I am slightly afraid of them, LOL. Do you use a eyelash curler? If so, which one? Overall rating: A all the way! The performance does justify the expense, in my opinion, and I def. plan to re-buy this product. Love it! I hope you can read this! 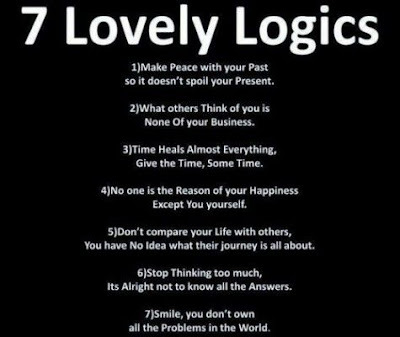 Very important stuff!! I could never, ever do this, but I love it! Makeup artist Kate Alves does this to herself!! I forget where I first saw the work of Katie Alves, who is, needless to say, very talented beyond her years, but that doesn't matter - I'm a huge fan! She is young, creative, and I am looking forward to seeing more of her work over the years - it can only get more amazing as time goes on, although I can't imagine how! Yes, "wow" pretty much covers it! You can see more of her work on her site! Thanks for letting me share this Katie, I adore you! 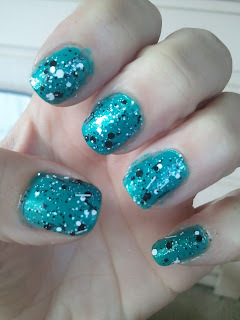 Zoyas Summer 2012 Collection, as you know by now, is comprised of two collections. The Beach collection has 6 cremes and the Surf Collection has 6 coordinating shimmers. I love pretty much all of them, but Zoya Shelby was my first purchase of this collection. 1. 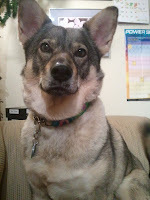 The love of my life is my dog, Shelby!!! She came with that name from the Shiba Inu Rescue of Texas (rescue your buddies, don't buy from a breeder or pet store, please!!) but it fits, she is quite the little lady. Isn't she a doll? :) If you're interested in following the fascinating life of my Shiba Inu, check out her Facebook page: Shelby Roberson - World's Happiest Shiba Inu. Yes, I am one of "those" people who has made a fan page for her dog because I think my dog is unique, brilliant, cute as heck, and worthy of people worldwide adoring her! Dramatic much, right?! Shiba Inus are actually much more popular in Japan (where they originate from) so she does have quite a few international followers. Technology rocks. 2. Shades of pink and lavenders are my favorite nail colors. I prefer pastels in general. I honestly don't think I've ever painted my nails black, navy, or even a maroon, for that matter. Actually, I recently bought a HITS Glitter from Llarowe that is a chocolate brown glitter. It looks amazing in the bottle, but I haven't tried it yet. This is definitely Barbie Car pink, a true creamy baby pink. It is feminine and an excellent addition to my collection. 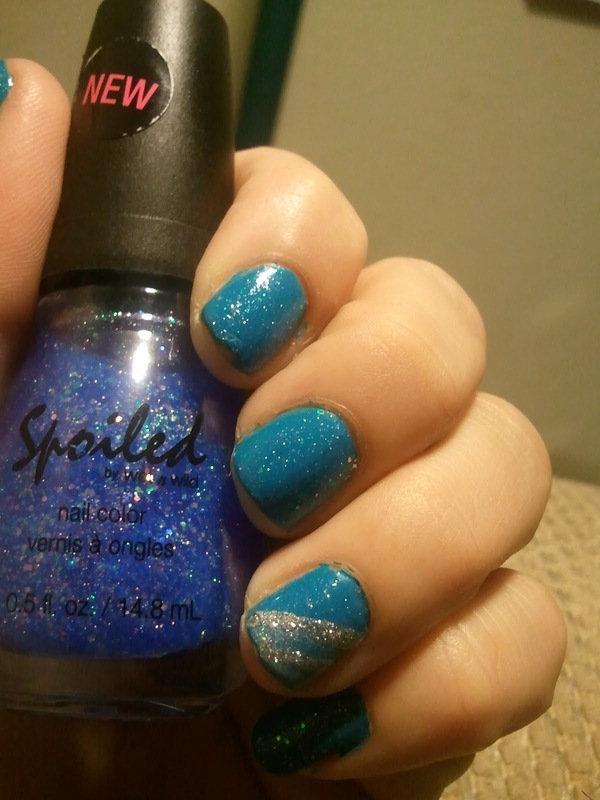 I have it on my toes right now with a simple sparkly topcoat and it's pretty much perfection. 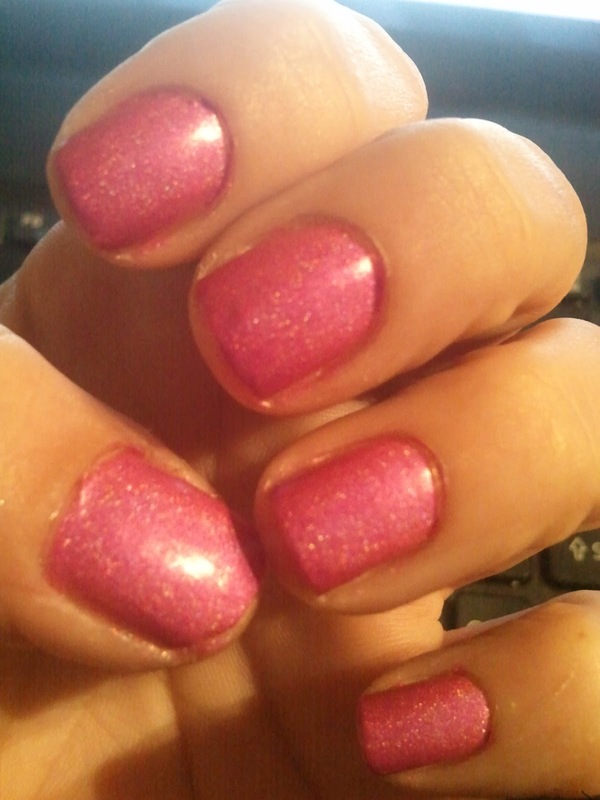 Anyway, this is OPI basecoat and two coats of Zoya Shelby. 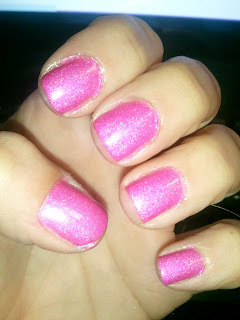 It is a great pink creme, easy to work with and only needing two coats for full coverage. My accent finger has Lynderella Connect the Dots and a nameless nail art brand in black for the lines. The silver down the middle is Covergirl City Lights Sparkle, which I adore and will be running out of shortly! What do you think of Shelby? Don't you think I should paint my Shelby's toes in Shelby colored polish!? Maybe I can get a petition going and present it to the boyfriend! LOL, he is so against me painting the dogs nails, and I haven't yet...but when there is the perfect color clearly named after my perfect dog, shouldn't we make an exception?? Dare To Disagree With Medusa? Mary's Eye Look Of The Day & My First Guest Post! Today I have something awesome to share! I am pleased to present my first guest post by my younger, brilliant, gorgeous, talented, kind, bright, clever, all around amazing cousin, Mary! 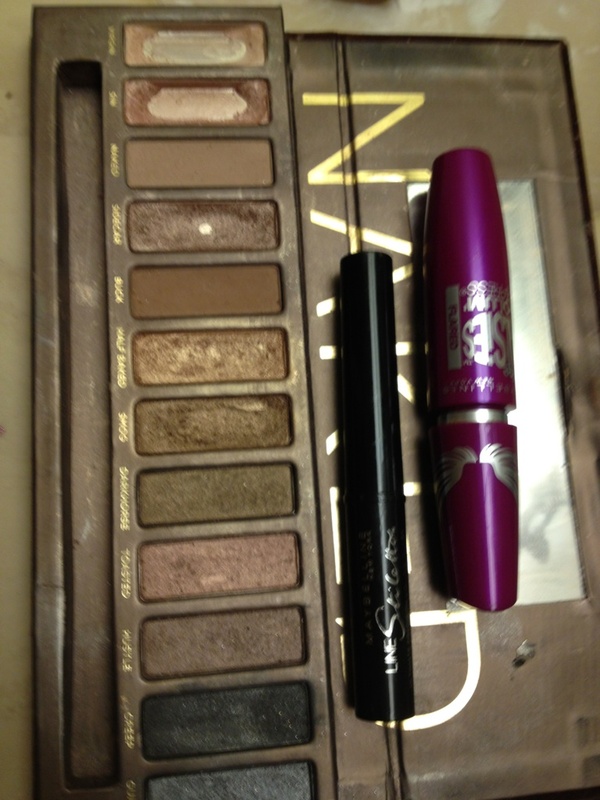 Her look, below, was done with the Naked palette, the first version. I think she did a great job and if those eyelashes didn't run in the family (thank goodness, they do) than I'd have to kill her! Look at those lashes!! Take a look below and if you want more of Mary, let us know in the comments. You can also follow her Photography page, too - click here to visit Mary Chrystal Photography! Check out the finished product...and seriously, those lashes?! Love this look and loove you, Mary! Thanks for the guest post! 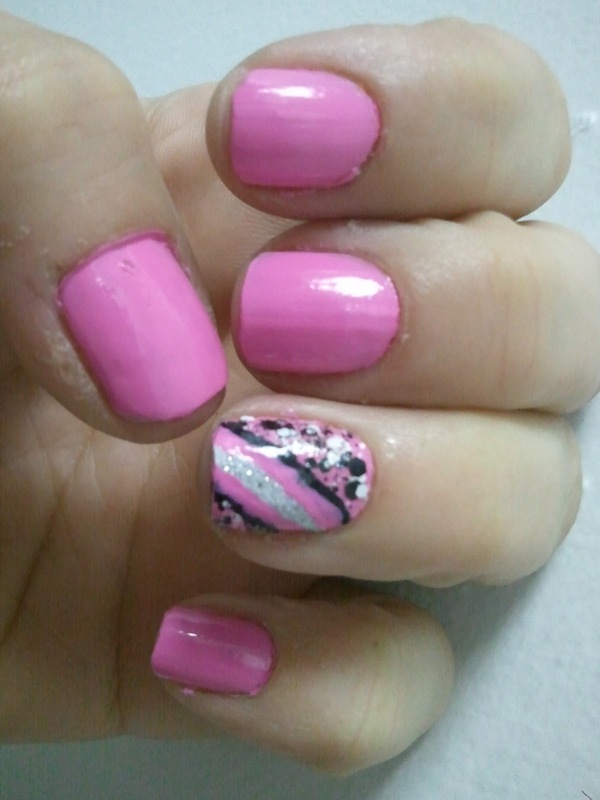 One day when I had more-than-average time available for a mani, I did this! The base is Sally Hansen Pacific Blue, and the clouds are Confetti White Out, a drugstore cheapie. The sun is Mellow Yellow, Sally Hansen also. It's been a while since I did this but I have to post some past pictures because I bit my nails off during a stressful last few days. You know those weeks where every aspect of your life takes a turn for the worst? Yep. One of those. Anyway, I don't remember the exact colors of the rainbow, but I know a few. The purple is Zoya Malia, the yellow Mellow Yellow, and the orange is really Revlon Peachy. I didn't wear this for long. My lines aren't too straight and the OCD-ness in me couldn't deal with that for too long!! I looove shopporting (shopping while supporting a small business!) Llarowe. The woman who runs it, Leah Anne, is a sweet lady, generous with giveaways and attentive to her customers. She carries some HTF brands and some non-US brands, giving us easy access to some gorgeous brands, like HITS which is (I believe) made in Brazil and Ludurana polish, among others. 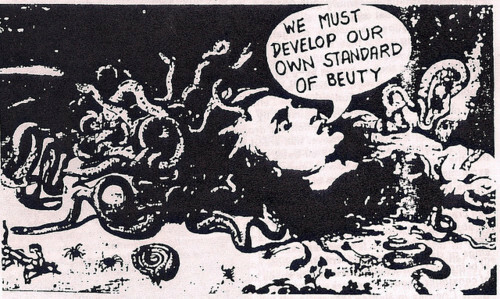 She is also the exclusive seller of Lynnderellas, the Endangered Species of the indie world, as far as I know. I've barely gotten into the indie world, but from all the reviews and comments I've read, Lynns are known for their performance, uniqueness, and overall amazing-ness. I am in one polish group on Facebook (hey girls!!) and while we swap all types of polish, there is one official document JUST for Lynns. It's that serious!! 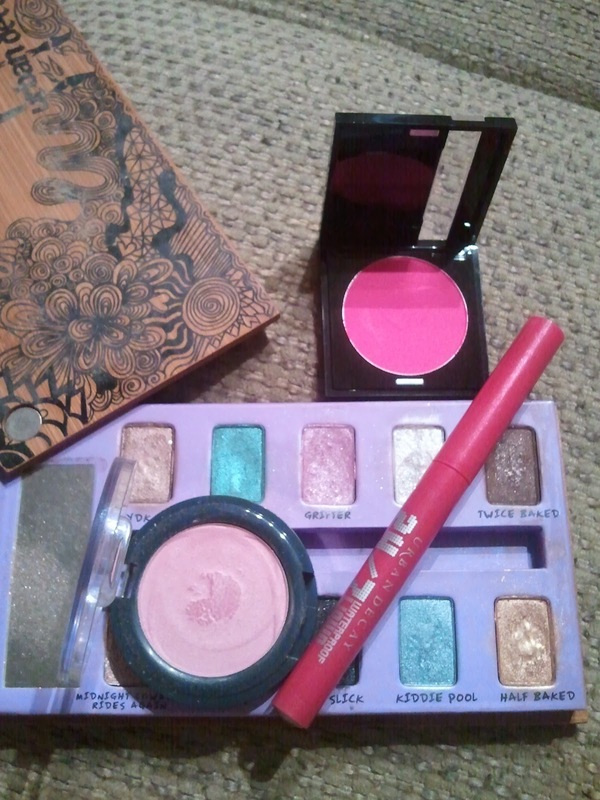 Pinks and lavenders are my weakness, so this haul was mega eye-candy to me. I waited from January until mid-May for Nosegay and it was worth it! Leah Anne was able to combine ship an order for me (thank you, Leah Anne!) 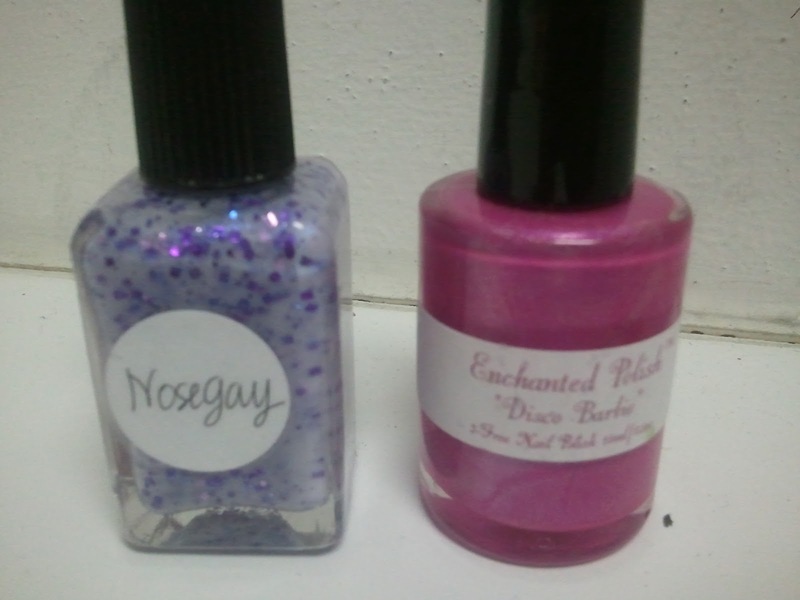 and I got Enchanted Polish Disco Barbie also. This was a must have for me! HOT PINK HOLO! This is a one coat holo and an incredible formula. I wish Enchanted made minis. There are a few colors I would never use more than once or twice (blues and greens, I mean you) but I would buy them anyway because of this superior formula. Below is two coats of DB and no topcoat. Stunning, isn't it? 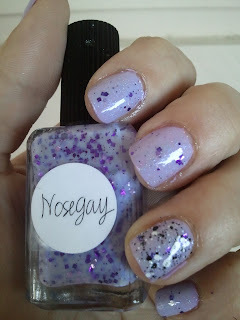 Nosegay means a small bouquet of flowers in French and it is a lavendar base with darker purple glitter in squares. There is a fine silver microglitter throughout, like Connect the Dots, giving it a ridiculous 3D shine. 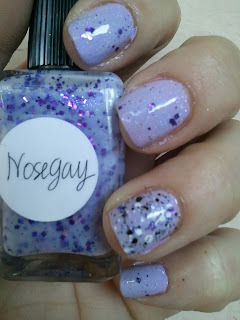 This is Nosegay over Sally Hansen's Lacey Lilac. I obviously had to own it from the name alone, but the fact that it is a lavendar makes it a must have for me anyway. Lynn Nosegay w/Sally Hansen Lacey Lilac with a Connect the Dots accent nail! What do you think of these lovelies from Llarowe??? Nail Mail! Featuring: NEW Lynnderella! I get my packages delivered to my office instead of my apartment for a couple reasons. First, since I am at the office, I get instant gratification. I can open the package and ogle it's contents even before I get home. Secondly, it's just safer and more convenient. I live in an apartment complex and if the package didn't fit in the itty bitty slot, it would either be left at my door (bad idea) or left with my landlord, who isn't very...consistent with her schedule, let's say. Anyway, this morning, two lovely packages were waiting for me! What a way to make Monday a little better, right?? The first package contained a few items I bought from a blog sale. I've wanted Revlon's Whimsical for a while, but didn't want to pay the drugstore price until I found a sale and that polish available at the same time. I'd rather use my money on a unique indie polish, most of the time! Anyway, Michelle had Whimsical, a light blue base with glitters and it's similar pink counterpart, Popular, so I snagged both! I also got my first Color Club in Hydrangea Kiss, which is a beautiful deep cornflower blue. 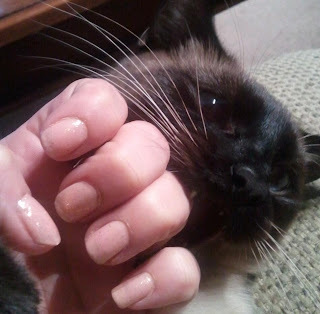 And, to save the best for last, I also received China Glaze's Awakening from her. How pretty is that wine with a gold shimmer to it? So glad I picked that one! I realize that neither Color Club nor China Glaze are rare or hard to find, however, it is my first of both of these brands! Two packages + two new brands + 1 new Lynn = awesome.nail.mail!! I know you see that Lynnderella Snow Angel right there!! I was able to acquire this from a swap. I gave my Lynn Attitude Adjust-Mint and received this. 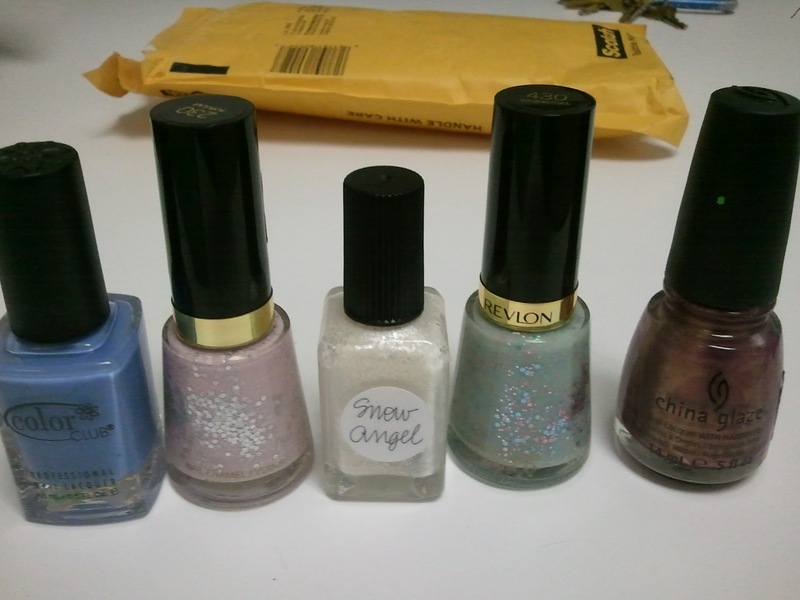 I think it was a good idea because Snow Angel will add plenty of versatility to my polish wardrobe already. It is a light white base with white glitters of varying sizes. It is soo pretty and I cannot wait to try it over something already light and pretty, like a lavender! Once my June No Buy is over, one polish I *need* is a great, bright light blue base. I need it for the base of Whimsical and also for Poseidon, a light blue holo from HITS. Poseidon just doesn't glow enough on it's own, in my opinion, and needs a light blue base. This is Mao "Carmello Anthony" Roberson. You'll see a lot more of her. I am thinking "Mao Mondays" and "Shelby Saturdays" and a picture of my lovlies on those days. A lot of the bloggers I follow feature children, but my children have 4 feet and are fuzzy monkeys. I forget which polish I am wearing here! I believe it's OPI Sandstone with Zoya Chloe over it. 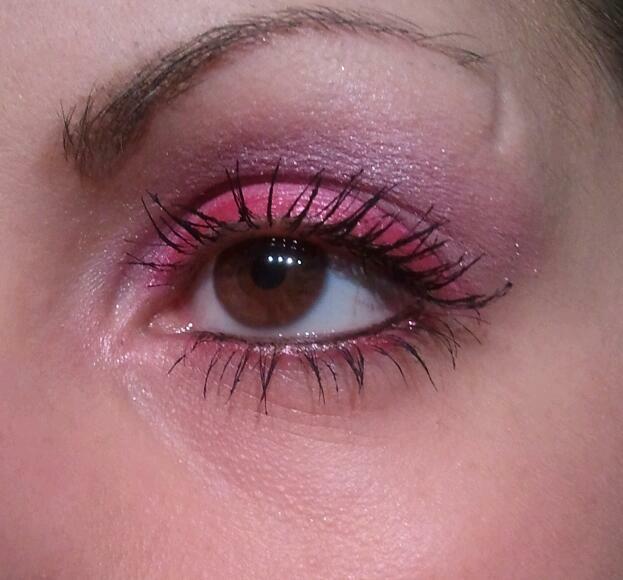 Look Of The Day: Pink Smokey Eye! During the week, I am a mild mannered teacher and office worker. In the office, I can do my hair and makeup however I like, but school is another story! Since I am on the younger side for a Professor, I feel like I should look polished and professional. Alas, to me this means no MUFE #75 neon pink eye shadow at school! I usually do my nails in bright, crazy patterns and colors and save the neutrals for my face (most of the time ;)). 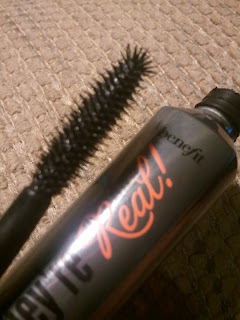 Mascara: Benefit's Their Real - LOVE this stuff! Separate post deserving-worthy!! Fun, right? Def not a safe-for-school look, in my humble opinion. 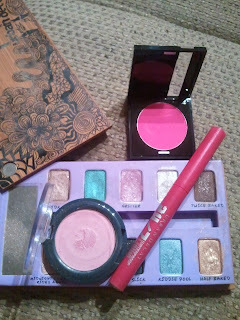 I am going to write about Benefit's Their Real alone because that stuff is simply the bomb. It can take a woman a while to find that mascara that just DOES IT for them, and this is it for me. My less expensive choice is Maybelline's Define-A-Lash and it's nifty rubbery brush. This is on the more expensive side BUT not really in the world is mascaras. I think it was $19 or $21 or so. Sidenote: I'll probably never do a video tutorial for a couple reasons. 1) I'm not nearly talented enough to compete w/some of the amazing people out there, and 2) I don't use brushes. I am a happy 5 year old finger painting on her face!!! You don't want to see that mess, trust me, but the finished product looks okay, right? Lynderella: Connect The Dots - My Favorite Polish EVER! Yes, that is a pretty bold claim for a makeup and polish blogger, claiming a "favorite" and "must have" item right off the bat, but I am pretty confident about this statement. 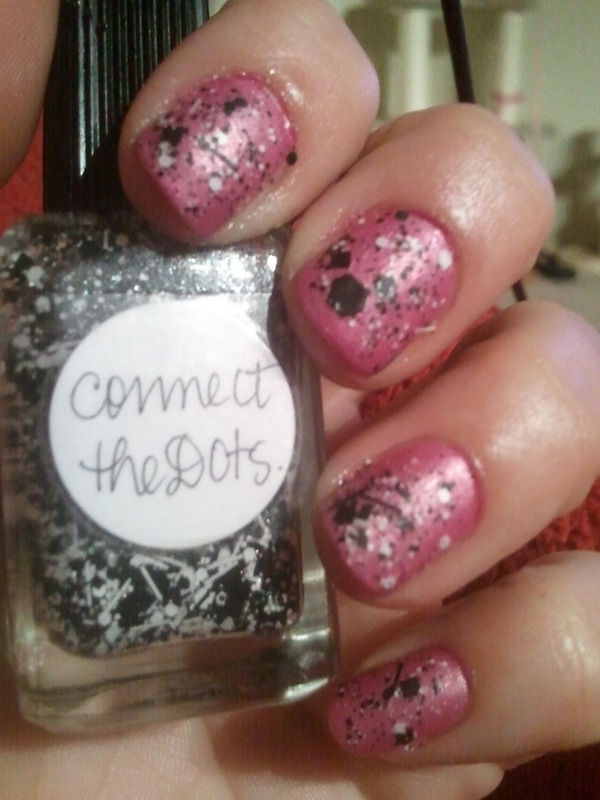 Connect The Dots is my favorite polish ever. I love it because it is unique and versatile, it is that special jacket or accessory that you can wear with any outfit and go anywhere, and it just always works! 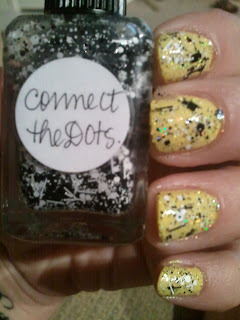 Connect the Dots is made my Lynnderella and her polishes are sold through my favorite indie polish shop, Llarowe! I wish that site had an Affiliate program, LOL. CtD is a clear base polish with black and white glitter of all shapes and sizes. There is also a fine silver glitter that runs throughout. You can add this, with only 1 coat necessary, to any color and make it extra special. CtD over Sally Hansen "Mellow Yellow"
CtD over UP Holo "Rosa"
CtD over Sally Hansen "Real Teal"
It goes well over solids, glitters, holos, anything you can think of! Apply this with a stippling technique for best results and do not rub the brush on the bottle lip too much - you want the goodness ON the brush! 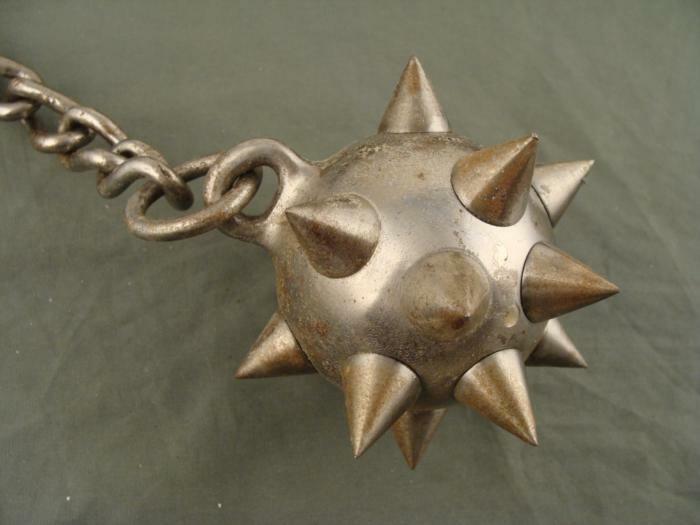 What do you think of CtD? Is this a must have for your polish wardrobe? Intro Post - Hello World! Wow! If I had any idea that it was this easy, I would've done this a long time ago. Welcome to My Boyfriend Hates Makeup! My name is Lacey and I love makeup, nail polish, beauty products, and all things girly. I plan to post Looks of the Day, How To's, polish looks, tips, and interesting photos and stories. I like playing with new products and testing new things, especially indie products from small businesses. I was inspired to create this blog, separate from my (currently untouched) blog www.laceychrystal.com, which is my more professional side, because of the polish you see below - Connect The Dots, a creation by the lovely Lynnderella. Isn't this a unique creation? There is more of this to come - this is where the fun stuff shall live! Do you think we can work together? ?